To the mother of Kings Island what does the gem on the banks of the river have in store for 2016. I don't think it will be huge still hoping for a family lig flume dark ride of sorts or a coastet even in size with Stricker Grove. Time shall see but let's just hope for the once big park in Cincinnati will continue to grow. To those that dont know who the mother of Kings Island is.. it's Cincinnati's Coney Island. As far as my thoughts, I think a log flume returning to Coney would be fun but Im not so sure if its the kind of addition that's best to happen there. In the last two years they saw two adult flats that are kinda fun and great fun. I feel if they are to add something, it might be away from the dry park. Though if Im wrong, which is very likely, I think a dark ride would be awesome to have at coney. And they could easily have the best dark ride in the region because lord knows there isnt an outstanding one around town currently. Well, ponder this. The rides side has seen a new addition each of the last three seasons. The last new addition over at Sunlite Pool was Twister, which opened in 2009. This year saw the introduction of TopSpin and Fender Bender. Last year saw the introduction of Wipeout. And 2013 saw the introduction of Como Cruisers, which replaced the Bumper Boats. I think its about time the pool get something new. I am excited to see what they do next year. A Gravity Group coaster would be a big hit at Coney.. But, wouldn't the chance of flood be a reason not to build wooden there anymore? And why a fairly cheap steel coaster is the only one currently there? Though, if we could dream, one of The Gravity Group's mini-woodies would be a blast to have at Coney. Obviously not intertwined with a bunch of other coasters, but something of this caliber would be a dream come true.. if nature would allow it. I agree that a ride like that would be a huge hit. It would certainly tip those on the fence into visiting the park, especially those who have never visited Coney before. Coney is a once every few years park for me. If they added a small Gravity Group woodie, they just might become another of the parks to which I buy season passes. 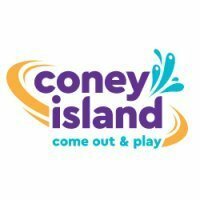 How did Coney fare during last spring's floods? Were they high enough to affect them? I'm guessing so because the eastern road towards Belterra Park was flooded and had people riding canoes in the "streets". Coney made it through the flooding the way they always do. Some hard work and cleaning from the employees and the park looks like new. The rides office (which is located right by Swing A Round), had about eight inches of flood water in it. On the flyers that the park was handing out yesterday with information on Fire Up the Night, there was a teaser on the bottom. It said "Big. Wet. Wild. Coming in 2016!" Hmmm. Hopefully, it's not Barton W. Kinzel. Terp, running for the river gate. While the current park president at Coney, Vic Nolting, is retiring soon, I can assure you that he will not be replaced by one Bart Kinzel. Any word where Bart ended up after he "left" Carowinds? He formed a company called The Kinzel Co. I am quite sure he got a large severance package, including a time limited non-compete clause. Hmmm... Wonder if the new attraction is a water ride or water park ride? Look at the recent history of additions at Coney. This year the rides side saw the addition of two new rides. Last year Wipeout replaced a ride. 2013 also saw a ride replaced by another ride (Como Cruisers replaced bumper boats). The last new addition over at Sunlite Pool was the Twister water slides, which were installed back in 2009. So it might be time for something new over at Sunlite. But then again, a water ride or log flume could be a big hit at Coney as well. It is quite hard to see into the future before something actually happens. Predictions are hard, especially when they are about the future. They also posted this caption to the image: "A storm is coming in 2016. Big news coming soon! Keep an eye on our Facebook page and website for updates." Maybe there will be a storm chaser nearby to help out. Coney posted another tease to their Facebook page yesterday (see below). They will announce the new addition next Thursday. The first water coaster in the Tri-state area??? If they added one it would be the third in the area, behind Big Kahuna at The Beach and Hydro Plunge at Great Wolf Lodge. A huge family water ride would rock 4 to 6 passenger. Hmm, a toilet bowl maybe?